Even with a far less convoluted interface than the NEX-7’s, the NEX-6 doesn’t skimp on ergonomics and features, with its adjustable screen and its high-resolution OLED electronic viewfinder. The NEX-6 keeps the abundance of modes gracing recent Sony models, along with Full HD video recording in 50p, multi-shot Superior Auto mode, and as a bonus — WiFi. The NEX-6 uses the well known and perfectly mastered 16-Mpix Exmor APS-C CMOS sensor that astonished the photo world with its dynamic range and high-sensitivity image quality, as confirmed by our tests on the NEX-5N and the SLT-A57, which share the same sensor. The NEX-6 has a sensitivity range of 100 to 25,600 ISO. If we had somewhat unconsciously felt that there was something missing in previous Sony compact hybrids, the NEX-6 by contrast feels like an embarrassment of riches: it is equipped with an integrated number 6 flash (a real plus compared to the NEX-5N and 5R), and is delivered with a small, non-integrated external flash. We also find the same 2.36 million-point OLED electronic viewscreen found on the NEX-7 and the SLT-A77; a 3-inch, 921,600-point adjustable screen; and a rapid burst shooting rate of 10 fps. 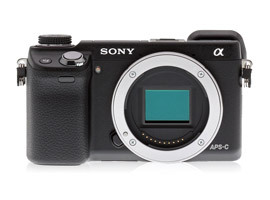 The camera retains the Superieur Auto mode, which uses multi-image capture for different modes — HDR, backlighting, bokeh, hand-held night photos, etc. The NEX-6 also offers Full HD 50p AVCHD video for a bit rate of 28 Mpbs and continuous autofocus, along with an integrated stereo microphone. The NEX-6’s control dial makes it easy to switch between PSAM modes. The NEX-6 is WiFi-capable just like the recently-announced NEX-5R. It can communicate with a smartphone, a tablet, a computer, and connect via a hotspot for sharing photos and videos by mail or on social networks. It is also possible to download PlayMemories applications with which to customize the camera. The NEX-6 will be available during November 2012 at a price of $1,000 in a kit with the new 16-50mm SEL1650 lens, a far more attractive lens than the 18-55mm usually delivered with Sony compact hybrids. The Sony E PZ 16-50mm F3.5-5.6 OSS is a compact zoom endowed with a telescopic mechanism similar to that of the Panasonic G X Vario 14-42mm Power zoom. It provides image stabilization along with the equivalent of 24-75mm, more wide-angle than most of its competitors.